March 12, 2018 by Ecommerce News. About Statistics with tags Denmark, Finland, Norway, Sweden. 5958 views. The ecommerce industry in the Nordics (Sweden, Denmark, Norway and Finland) was worth 209,6 billion Swedish kronor, which corresponds to over 20.6 billion euros, last year. Almost forty percent of the total Nordic ecommerce revenue was generated in Sweden. These numbers are calculated by PostNord [pdf], after it asked 92,000 respondents in Sweden, Denmark, Norway and Finland how much money they spent online during the last month. In Sweden, about 8.2 billion euros were spent at ecommerce websites last year, while Danish consumers spent 5.18 billion euros. Less money was spent in Norway and Finland, with estimated ecommerce revenues of respectively 4.65 and 2.58 billion euros. The highest amount per person was spent in Denmark, where the average consumer spent 217 euros per month. More than every third online consumer in the Nordics orders from abroad and in total these cross-border shoppers spent 3.62 billion euros on online purchases from foreign websites last year. When it comes to foreign trade, Finland is the champion of the Nordic countries. A total of 44 percent of Finnish consumers shop online at foreign websites every month. Most popular destinations for cross-border ecommerce in the Nordics are China, the United Kingdom, Germany and Sweden. “Today’s consumers are becoming increasingly global in their buying behavior and it’s important to bring it along when you develop your ecommerce strategy. There is a great potential for Swedish online retailers to reach further than the Swedish markets”, says PostNord Sweden’s retail analyst Carin Blom. 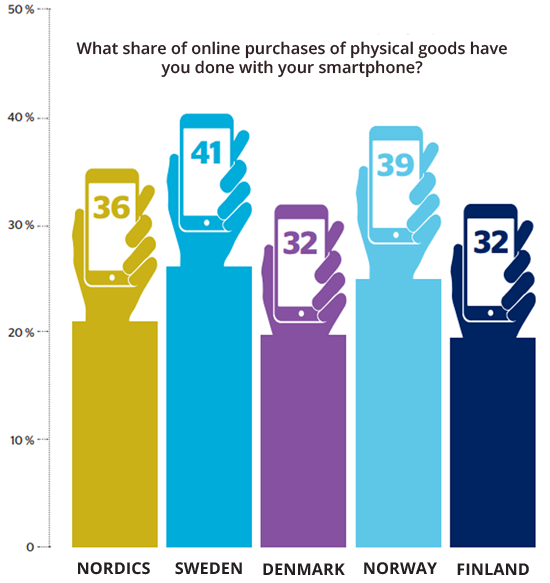 The mobile phone becomes an increasingly important tool for Nordic online shoppers. The smartphone is used for researching, checking stock and price tags, asking for advice and of course, for purchasing. About 36 percent of Nordic consumers said they made one or more purchases with their phone, which is a sharp increase compared to the 26 percent of 2016.